HORSES, HORSES, HORSES! Loved them as long as I remember myself. Their elegance, power, and beauty are my inspiration. I fact, I discovered my artistic talent through painting these majestic animals. My first drawing was a doodle of a horse that I scrabbled on a piece of paper when I was 3 years old. Since then my passion for art and horses were inseparable. I paint these amazing creatures in different styles and media constantly experimenting and exploring the magic element of painting. My latest works are presented here, showcasing my newly-developed technique. 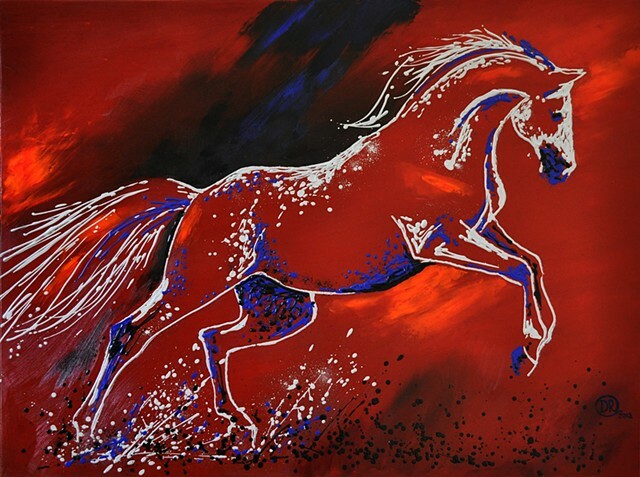 By creating a painting through splashes of color against bold, contrasting background I intend to convey intensity and excitement, accentuate power and movement of these magnificent animals.